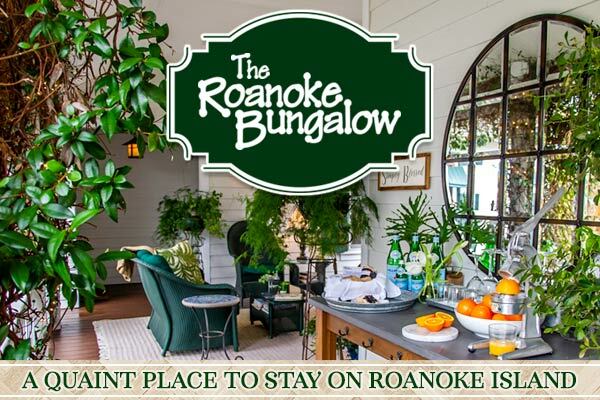 Featured in the Roanoke Island Home & Garden Tour and the Holiday Tour of Homes, the Roanoke Bungalow is a newly renovated Arts & Crafts Bungalow, originally built in the 1930’s and home to the Owners’ mother’s family. Now a Manteo Bed & Breakfast Inn, it proudly features a Historical Plaque on the front of the home and offers two luxurious guest rooms for Roanoke Island visitors. Enjoy homemade from scratch cookies by a local baker ~ The Sweater-Box Confections ~ with varieties such as Lemon Lavender and Salted Chocolate Espresso Shortbread which are in the room & a beverage, which will be available on the deck all day, when you arrive at our Manteo Outer Banks guest cottage. Then walk to the historic waterfront district of Olde Town Manteo where you’ll find art galleries, antique shops, wonderful restaurants, gift boutiques & boat tours. A favorite local ice cream shop is right next door for a refreshing evening treat. Enjoy each morning, a fresh “Bread Basket” served with locally homemade jam by ~ Island Jams, with flavors such as Breakfast in Bed, Carolina Blue Delicious, Triple Berry Sunrise, Taste of Summer, Sunny Day & Summer Breeze to name a few. The basket/ tray will be placed on the serving cart on the deck each morning along with fresh oranges for “Fresh Squeezed” juice to go with!